TT Spotlight: 3 FAB things you need to know about! 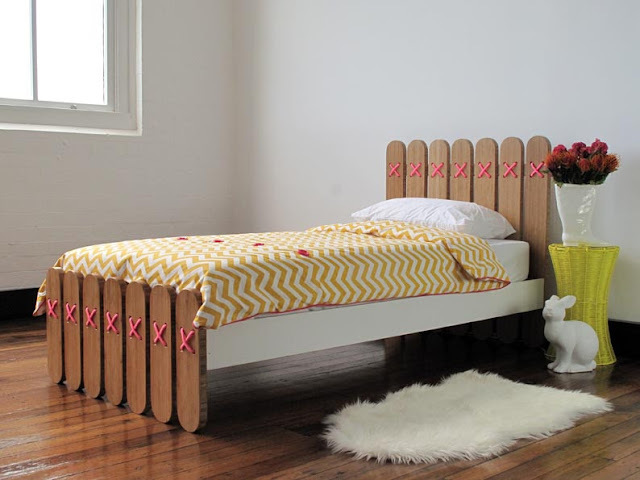 The "Pop Single Bed" was inspired by a childhood spent fashioning houses, boats and rafts out of paddle pop sticks. Designer, David Hardwick of Hardwick & Cesko wanted the look and construction of the bed to be easily related to a child's own experience and understanding of the world. Together, the soft, curved shapes and quirky rope detail (in neon pink or natural) create a safe, sturdy bed with a sense of mischief and nostalgia. Available in Single & King Single size. fragrances). More than two decades later and they're still going strong, launching their newest product MultiVitamin Power Serum (part of thier AGE Smart line) TODAY! So. What exactly IS it? A potent, more skin-friendly form of vitamin A, with a groundbreaking new formulation process (somebody say " liposomal preparation technique"?) which enhances the effectiveness of the serum. Slap it on in the morning and/or at night for an instant, antioxidant-rich hit of vitamins A, C, E and F. Enhanced cell-turnover? No problem. Reduced hyperpigmentation? Sorted. A smoother surface appearance? Absolutely. Rrp $85.00 for 22ml. On beauty counters and in salons today. PS Buy it online at Dermalogica and enjoy free delivery and samples with every order! Runner Bean Catering "believes everyone should enjoy healthy, freshly prepared meals every day". That’s why they decided to deliver the best restaurant quality home-cooked meals (and private catering) with a smile to "time-strapped Northern Beaches professionals and families". Runner Bean Catering Head Chef and founder, Nick Meredith Jones is passionate about nutritious food that tastes great. He’s worked in some of London and Sydney’s top restaurants (more recently The Boathouse and Barrenjoey House), and grows some herbs and vegetables right outside the Runner Bean kitchen so he can bring you the freshest, tastiest dining experience possible. So. If you live "North of Avalon NSW", ditch those takeaway menus, plan ahead, visit Runner Bean Catering and prepare to be BLOWN. AWAY. We recently had a Runner Bean Catering moment after TT friend Heidi recommended it. There are no words. PS They'll be delivering to more Sydney Metro areas soon, so stay tuned! (above) My dinner. I think I may have gone back for... thirds! Dessert too? Totally. Thanks for every other informative site. Where else may just I get that kind of information written in such an ideal manner? I have a challenge that I am simply now operating on, and I've been on the glance out for such info. a litte more on this subject? I'd be very grateful if you could elaborate a little bit further. Thanks! Sawyer has more of a reputation for a 'harder' journalistic style. of revenue. You should know, Jessica replied: 'Oh, definitely kawaii! But provided they do, you probably have many things running through your head. This is a topic which is close to my heart... Best wishes!